it’s the wee hours of the morning here. I just slapped together an ad that was requested be made by Timothy Don, Editor-in-Chief of Radical Society, a quarterly rag of rants and raves (it flows so well!). 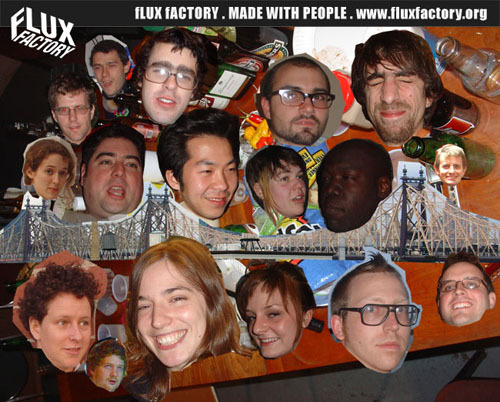 The ad is for Flux Factory; unfortunately I didn’t have enough time to find or enough images (to begin with) of everybody whose ever been at or whom I’ve worked with at Flux Factory. So a few faces are missing, but the ad should serve its purpose of helping to promote Flux Factory, and that’s all that matters. In Radical Society the image will be repoduced in black-and-white, but here and only here (exclusive content!) you get to see the ad in all its wonderful colorful glory!